Many, but not all, of our pages carry date information on the various rifles illustrated or discussed, where it has been possible to be sure of data. There are a number of methods by which a rifle can be dated, or at least bracketed between certain years of manufacture. For the latter, dates of introduction of military arms can be located within the Government "List of Changes" (LoCs) as can dates of obsolescence and of modification or upgrade to later marks. Basic information on these lines is on site from our Chronology of Enfield genre Training Rifles, Adapters & Cartridges. You may not necessarily find specific date information within the text of particular pages, but often the images of advertisements or catalogue entries contain some dating 'give-away', such as the year in which a particular rifle achieved a notable competition score by someone, but which data is in graphic format and therefore not "searchable" by a text search engine. Do not briefly glance over a page and assume that the information you require is not there. It may not be immediately obvious, but careful observation may provide you with the information for which you are looking. Such research is a major part of the joy of owning, collecting and shooting classic or historic rifles. As far as civilian rifles are concerned, some manufacturers have their own dating systems, with, for example, prefixes or suffixes to serial numbers providing that information. Anschutz target rifles fall into this category, and their system is given on the page for these rifles. Quite apart from such dating information as we have been able to provide on many of the individual rifle types included on this website, there are other ways in which you may be able to confirm the date of manufacture, or at least the date of proof, of your rifle. Do remember, though, that date information coded with proof and Proof-House inspection, viewing or identification marks, does not necessarily coincide with the date of manufacture. Because many rifles may have been imported or, prior to sale on the civilian market, have only had military proof marks, then dating from the Birmingham or London Proof House marks needs to be treated with a degree of both caution and common sense. All firearms sold to private individuals in the U.K. have, for many years, been legally required to carry proof marks from one or other of the Proof Houses. This is mandatory, in the interests of public and personal safety, and any imported, previously un-proved firearm or "Sold out of Service" ex-military arm must be so proved. Rifles without modern proof still regularly appear on the market, having lain in store for decades. This is nothing new, and proof-house date marks from years past may still not indicate the rifle's date of manufacture. However, if an estimate of the rifle's age from other sources closely matches the date marks, then you probably have pinned down when it was made within a year or so. British and Commonwealth Service rifles can sometimes be dated by their serial numbers and prefixes, and the manufacturing works can be identified by manufacturers' coded leter and number marks. The keenest researchers will search manufacturers' records where such are archived or available. Fortunately, many of these scholars make their work available to the public in reference books, and details of a number of the most useful ones are to be found in our Bibliography. It is worth mentioning one or two books in particular from which much data relevant to this website's subject matter can be sought. "The Broad Arrow", and "The Lee-Enfield Story by Ian Skennerton, afford many specifics of manufacturers' and unit codes and proof marks, and of rifles of Enfield origin respectively. For B.S.A. Co. civilian production of target and sporting rifles, then purchase a copy of " B.S.A. - The Golden Century by John Knibbs. The ISBN numbers for these reference books are in the bibliography. Hitherto, John, who worked for the B.S.A. Company for many years and holds most of those records not destroyed in enemy bombing raids on the factories during the War, has been willing to help date a particular B.S.A. product where possible, and charges a fee which is donated to one or other of his chosen charities. It should be borne in mind that there is rarely a better way to find out more about your chosen rifle than buying one of the marque or model specific books authored by someone who has spent much of their life researching the subject. Such a purchase additionally supports such researchers and their work, and is, long term, to the benefit of us all. When inspecting your rifle and comparing marks with reference sources, be careful not to confuse date marks, or "private view marks", with inspectors marks, which usually carry the factory identification, e.g., "E" for Enfield, under the sovereign's crown, below which is the inspector's identification number; usually two figures such as "39". This is not a date mark, although occasionally the number may coincidentally seem to relate to one's approximate estimate of the rifle's age; it does not. Also be aware of the Birmingham Proof and Birmingham View marks - respectively BP and BV - each under a Crown. * With, for example, the BSA Model 15 or BSA Model 12/15 Martini-actioned rifles, the view mark should be visible both on the barrel and on the action body RHS top. With such B.S.A. rifles the Proof mark is only on the barrel (and on the action falling-block), and the third mark on the barrel is the 'NP' mark for Nitro-Proof, also below the crown. Proof , View and Black Powder or Nitro-Proof marks have to be easily visible to, for instance, the purchaser of a firearm. Thus they are usually very obviously stamped on the appropriate pressure-bearing parts where thay can easily be seen. The only exception to this is a comparatively recent situation in which the acquirer of a historically important firearm that may have been re-imported, and hitherto have carried no London or Birmingham proving mark, scan request, when that arm is sent for the necessary proof that, the marks are put out of sight, under woodwork for example, in order that the original appearance of a valuable piece is not spoiled.. However, date marks such as are under discussion and described below, are usually out of sight on the under-side of the barrel, and removal of fore-end furniture may be necessary to find them. Akin to the longstanding hallmarking system for British silverware, in which letter codes relate to years of manufacture or importation, is an equivalent employed by the British Proof Houses. The problem here is that, unlike silver hallmarking, the Proof House codes were only introduced in 1921 and have been only intermittently applied since then, almost on the whim of the Proof Master incumbent at any particular time. The system ceased to be used during 1941, since there was practically no civilian firearm production for the next five or six years, and, with war-time production levels reaching unprecedented proportions, almost all military proofing was effected within the various manufacturing facilities by Government inspectors. The coding was not reintroduced until 1952. 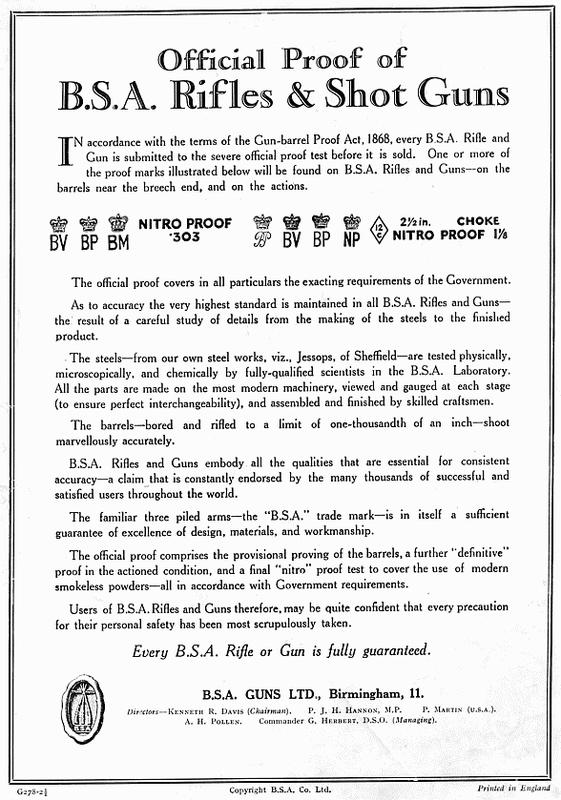 However, such date codes as there are are still useful in dating the many firearms manufactured between the First and Second World Wars, including much output from the Birmingham Small Arms Company ( see also BSA Rifles), as indeed is true post 1952 for those rifles more recently falling into the classic class. This so-called "secret" marking system was as follows, with the marks illustrated below applying as indicated. As far as we are aware, all B.S.A. production was proved at Birmingham and the marks should therefore comply with these series. These marks are also not to be confused with the crossed flags stamp of the miltary proof markings, which may carry similar letter codes identifying the country and/or place of inspection. From 1921 to 1951 Figure 1 applies, and for firearms proved between mid 1921 and mid 1922 the code letter is A. 1922/23 - B; 1923/24 - C; 1924/25 - D; 1925/26 - E; 1926/27 - F; 1927/28 - G; 1928/29 - H; 1929/30 - J; 1930/31 - K; 1931/32 - L; 1932/33 - M; 1933/34 - N; 1934/35 - O; 1935/36 - P; 1936/37 - R; 1937/38 - S; 1938/39 - T; 1939/40 - U; 1940/41 - V.
The alphabet was restarted several years post-war in 1950 with A, but now each letter change was made at the beginning of the year. The mark was modified to that shown in Figure II, with D to the left representing 1953, and the B to the right identifying the Birmingham Proof House. The number below identified the inspector. Thus the year codes have hitherto been understood to be 1950 - A; 1951 - B; 1952 - C; 1953 - D; 1954 - E; 1955 - F; 1956 - G; 1957 - H; 1958 - J; and so on through to 1974 - Z; ................ we also believed that Q was then used in this series for 1965. However, we have been made aware, by a contributor, of two contemporary rifles, a BSA Mk.II Lightweight Martini International and a BSA Century, that each carry what certainly appears to be the letter "I" in the left quadrant (as in Fig.II above). This would suggest that "I" as well as "Q" was no longer deemed to be ambiguous, as had previously been the case with the Fig.1 stamp configuration. There is therefore an undeniable possibility that year letters after 1958 may each represent dates that should be advanced one year, with "Z" falling in 1975, although this would then conflict with the 1975 commencement of the next series. Confusion remains; unless you know differently. Conjecture may suggest that perhaps there was even indecision at the Birmingham Proof House, and only a few rifles were stamped with an "I" in 1958 before "J" was substituted, or, a long shot, the 1957 "H" stamps wore out before the end of the year. We may never know the answer, but can meanwhile entertain ourselves dreaming up such explanations. The two markings are shown below, the International to the left, and Century to the right. From 1975 a further modification was made to the mark, as in Figure III, with another adjustment soon after to Figure IV. The date code letters were thus 1975 - A; 1976 - B; 1977 - C; 1978 - D; 1979 - E; 1980 - F.
To give some idea of what you are looking for, the image below shows the mark, as Figure I, on a BSA Model 15 rifle. It is to be found under the barrel just foreward of the receiver, and requires removal of the fore-end woodwork to view. The rule is calibrated in millemetres. It is possibly the diminutive size of this mark, and its usually hidden location, which has led to it being described as 'secret'. In this instance, the code letter is 'M' for 1932-33, indicating that the rifle was manufacture, or at least proved, between July 1932 and June 1933. Note that this is a pre-WWII rifle. Post-War rifles such as the BSA Model 12/15 will not carry this mark. * A 1930s BSA brochure for their rifles included a page relating to proof of same.